It's time for another quarterly book update! If you haven't been following along, I decided to stop posting weekly book reviews and instead, write quarterly updates about everything I've been reading! Here's a look at the books I read through the end of summer! You can check out past quarterly updates here and here. "Fried Green Tomatoes at the Whistle Stop Cafe" by Fannie Flagg - I adored this book...absolutely adored it. I remember seeing the movie when I was a kid and being horrified by it because the only thing I remember was someone getting hit by a train. The book was beautifully written, was sad, yet funny, and was a really great story. I highly recommend this. 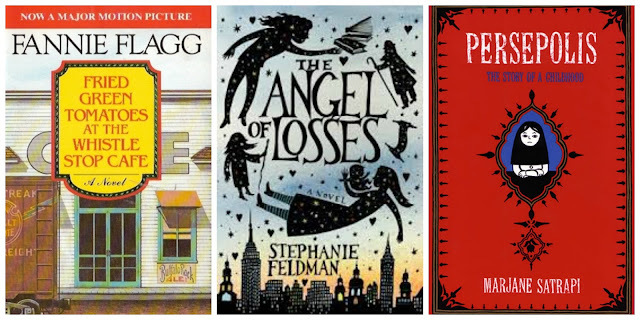 "The Angel of Losses" by Stephanie Feldman - I hated this book. The main character was insufferable and the book was weird. It was heavily based on Jewish folklore, which I know nothing about so I feel like context would have been helpful. The book read in parts like whiny teen angst (coming from an almost 30-year-old), heavy academic writing and folklore. I picked this up because it had a beautiful cover and one of the categories on my 2015 book challenge is to read a book based on its cover. This book proved the old adage. "Persepolis" by Marjane Satrapi - Carolann recommended this to me and I loved it. It was my first graphic novel and it was definitely the right graphic novel for me to start with. Persepolis tell the story of Marjane Satrapi growing up in Iran during the Iranian Revolution. It seemed strange to be reading about death and the Iranian Revolution in a comic book...it was almost a bit too lighthearted if such a topic can even be that, but from a YA perspective, I think it's a good read. I'll definitely read the other 3 volumes and will probably watch the movie, which my cousin Jen recommended. "The Book of Speculation" by Erika Swyler - I liked this book. I would probably give it 3 stars. I think I would have liked it more if I hadn't alternated between reading the book and listening to the audio book, but that's what I did to get through some of my long runs and it threw me off a little bit. I did love how all of the characters stories were interwoven in delightfully surprising ways. "Out of Africa" by Isak Dinesen - Nope. Hated it. This book read like a diary that someone tried to turn into a novel. The imagery was fabulous, but this book had no plot and I dreaded reading it every day. (When will I learn to put books like that down?!) 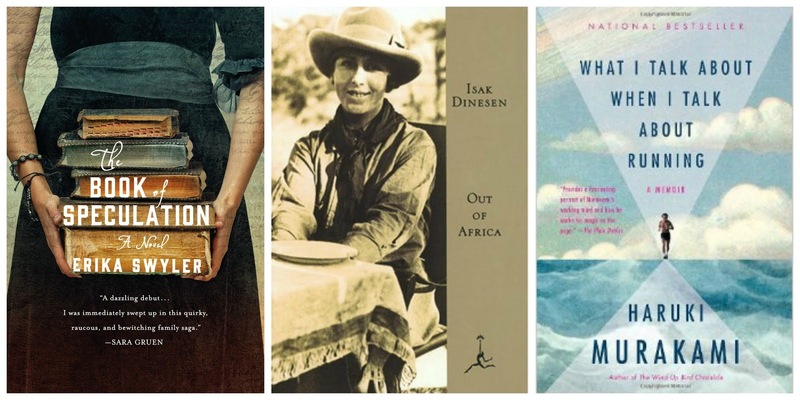 A lot of the criticisms of this book center around the white colonist living in Africa aspect and, while I found her attitude toward the "natives" (her word, not mine) dismissive, I can't judge her too harshly as that attitude was definitely a sign of the times. "What I Talk about when I Talk about Running" by Haruki Murakami - This book was ok. I really liked it at first...I got it. Murakami is a marathon runner and I could identify with just about everything he talked about. The book was supposed to chronicle his training for the 2005 New York City Marathon...and it did...until all of a sudden on "a clear autumn day in November," he ran the marathon...and then the book suddenly shifted to him tackling the Murakami Triathlon in July. No NYC race recap, no reflections on how his training had prepared him for the race...just like that it was over. "Is Everyone Hanging Out Without Me?" by Mindy Kaling - Tina Fey's book made me realize I didn't actually like Tina Fey. Amy Poehler's book made me dislike Amy Poehler a little bit. 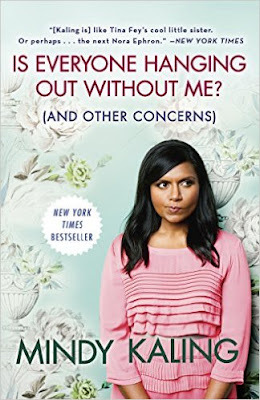 Mindy Kaling's book...made me feel like I was binge watching "The Mindy Project." Funny in small doses, but after awhile, it's all the same. This book didn't blow my mind, but I didn't hate it. I'm convinced Chelsea Handler is the only comedian who can actually write funny books (and I don't even like her). "Miss Peregrine's Home for Peculiar Children" by Ransom Riggs - This is a reread for me. I adored this book. "Hollow City" by RansoM Riggs - The sequel to Miss Peregrine's...you can read my original review here. "Library of Souls" by Ransom Riggs - I was actually a little bit disappointed with this book. I loved the first two books in the series (Miss Peregrine's Home for Peculiar Children and Hollow City) but I think Library of Souls fell a little flat. In the end, I think the series wrapped up the way I would have wanted it to, but I don't love the route Ransom Riggs took to get there. A lot of new characters were introduced in LoS while he main characters from the first two novels faded to the background in the final book. Are we friends on Goodreads yet? If not, add me!